Super easy to make, and an extremely versatile dish. 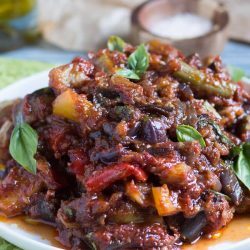 Fantastic served hot or cold, oven roasted ratatouille makes an ideal vegetarian main or a great side dish. It also freezes well, so why not keep a batch on hand in the freezer for an emergency meal. Chop the onion, capsicum, eggplant and zucchini into similar size pieces. I try to make them about 1.5 - 2cm in size. Place the chopped vegetables and garlic cloves in a large roasting tray. Drizzle over the olive oil, season with salt & pepper and toss everything together gently until all of the vegetables are coated in oil. Place the tray in the oven and roast the vegetables for approximately 40 minutes, or until the vegetables have softened and are starting to brown. Stir occasionally to ensure even cooking. When the vegetables are cooked, remove the tray from the oven. Decrease the oven temperature to 200C (180C fan forced). Squeeze the garlic cloves out into the bottom of the tray and discard the husks. Add the tomato passata, bay leaves and fresh thyme to the tray and stir to coat. Place the tray back into the oven, and cook for a further 30 - 40 minutes, stirring occasionally, until the sauce has reduced and noticeably thickened. Remove the tray from the oven and stir in the chopped basil. The key to this dish is roasting the zucchini, capsicum, onion and eggplant before adding the tomato passata. Roast the garlic at the same time as the vegetables, then squeeze the silky puree into the base of the pan when adding the tomato. If you are using garlic powder, just stir this is with the rest of the dried herbs. Make sure your roasting tray is large enough that the vegetables aren’t overcrowded, as they will stew instead of roasting. If your tray is not big enough, split the vegetables between two baking trays for the initial roasting. Once the vegetables are roasted, combine them on one tray to finish the dish.